(All sizes listed are US men sizes unless otherwise stated.) Black patent leather cap toe tuxedo shoes. The footwear with lightweight construction design giving the height you need unobtrusively. These shoes will appear as normal as they look when in actuality there is a hidden durable inner sole. Also built-in leather lining and extra padded for comfort of course.Smooth full grain high quality upper leather. Double padded collar for extra comfort.Lace-up shoes for a better personalized fit.Low top 2.6 Inches taller. Shaft stands at 5 1/4" tall including the outer heel (approx. 1 3/8"). Fully rubberized platform. 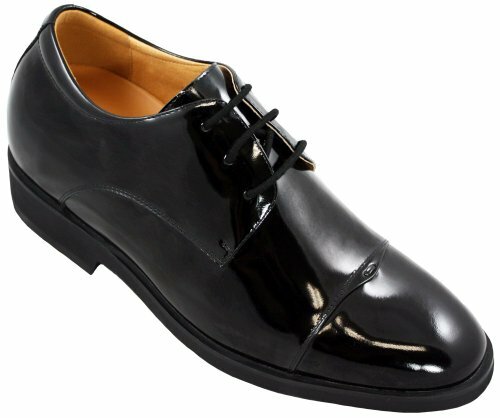 Black patent leather cap toe tuxedo shoes. The footwear with lightweight construction design giving the height you need unobtrusively. Smooth full grain high quality upper leather. Double padded collar for extra comfort. Lace-up shoes for a better personalized fit. Low top 2.6 Inches taller. Shaft stands at 5 1/4" tall including the outer heel (approx. 1 3/8"). Fully rubberized platform.